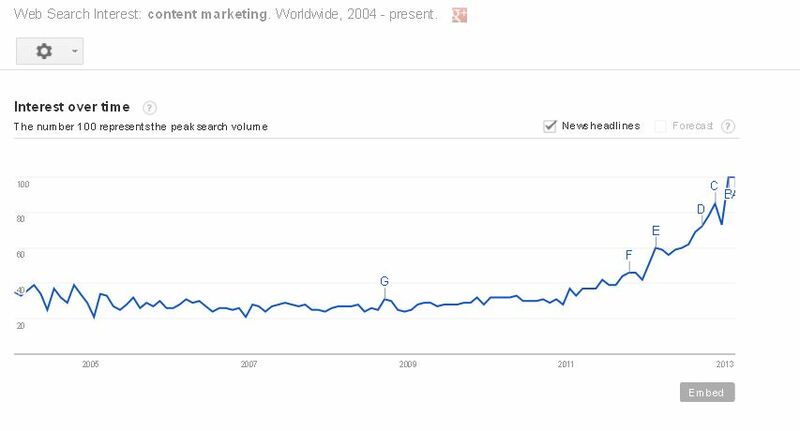 Content Marketing is being presented as the Shiny New Thing. Predictably, companies, brands and MBA marketers come flocking. It’s the new way to acquire customers! It’s the must-have strategy of the season. It’s making me a little more bilious with every iteration. I’m going to show you why. You can’t move for blog posts about Content Marketing these days. Or recruitment postings for Content Marketing producers/managers/creators. In the space of six months, it’s become the de rigeur thing that every business must do. That’s a lot of search interest. That makes Content Marketing a Shiny New Thing, doesn’t it? Of course it doesn’t. Sounds very a la mode, non? 1895 – John Deere launches their magazine, The Furrow, providing information to farmers on how to become more profitable. The magazine, considered the first custom publication, is a success and is still in circulation today, reaching 1.5 million readers in 40 countries in 12 different languages. 1900 – Published in France, Michelin develops the Michelin guides, offering drivers information on auto maintenance, accommodations, and other travel tips. 35,000 copies were distributed for free in this first edition. Eventually, the company began selling these books, yet the publication set a precedent for both informative guides and content marketing distribution. I’d also argue that cigarette cards are one of the earliest forms of Content Marketing with a history that can be traced back to at least 1885. Items such as pin holders have been around since the early-mid 1800s, apparently. Hell, the original ‘Soap Opera’ radio dramas were a content marketing vehicle (but I’ll bet their originators didn’t call them that). But woah! Wait up! Pin holders? Cigarette cards? They’re not content marketing, are they? Go back to the Content Marketing Institute’s definition – I think you’ll find that they are. In fact, every bit of tat given away by brands at trade shows or consumer sampling sessions could be termed content marketing. Of course, we’re now in a post consumer-tat world. We don’t give away cigarette cards because we can share hilarious videos of kitties. We don’t bother trying to make our print adverts into social objects because we can get thousands of impressions for a snarky comment on Twitter. The fundamental purpose of ‘content’ hasn’t changed is 200+ years. How do we increase our visibility with our consumers and get them to become advocates for our product, buying more product more often themselves and connecting others around them with our product? Once upon a time, it was a printed magazine, a recipe book or a cigarette card (which was only made possible, incidentally, because of a leap-forward in print technology which allowed smaller colour images to be printed quickly and cheaply). Now, it’s the YouTube ‘How To’ video, the White Paper, the Twitter update strategy or Facebook competition tactic. It’s the ‘content’ which fits 140 characters or an email. What we’re actually in the middle of is a modal shift. Content marketing is hundreds of years old. But we’re in the technological age where cost-of-entry has plummeted to the level that anyone with an iPhone can Vine the hell out of mug of coffee and call it content. Speed of distribution is no longer an issue, unless you’re slow off the mark and are thus just a Johnny-Come-Lately. Speed of creation has never been faster. And with this comes the lemming-like advance into the ‘new’ territory which must be strategised to death (or at least until the next Shiny New Thing comes along). We’re in the midst of Brand As Publisher age, and of course, people feel the need to strategise what they’ve always done to fit new channels – letting the channel dictate the effort where as the effort should actually be dictated by the content itself, and then remixed into the channels. Being honest, the whole thing makes me feel slightly sick. And every time I hear the phrase “Content Marketing”, I want to scream until I puke. Stop what you’re doing with Content Marketing right now. Put it down, step away. Why am I creating a new Content Marketing strategy when I’ve already got a marketing strategy? Why am I not creating a marketing strategy which incorporates brand positioning tools (white papers, blog posts) or consumer attraction tools (How To videos, cool videos, collectible POGs) as part of the holistic whole? Why am I making a Shiny New Thing out of a strategic/tactical device which has been in use for two centuries? Tags: cigarette cards, content marketing, marketing, rant, social objects. Bookmark the permalink. Hmm. I agree to a point. The thing about the modern view of content marketing that your post doesn’t acknowledge is that it doesn’t mean content that is funny, beautiful, shocking or memorable or entices you to buy in these ways. It means content that is USEFUL and that entices you to buy something RELATED to the free content (not a later paid-for iteration of the free service like the Michelin guides) because it wins trust and positions the expert as competent. This is relatively new and only possible because of the publishing revolution that is the Internet. It works. I buy everything from trainers to contact lenses to holidays these days based on the seller giving me free help with related interests. Thought-provoking post as usual! Good work! Thanks for the input, Mr T! I agree about the utility of certain content types, which I alluded to (but perhaps didn’t expand on) with the references to How To guides etc. I still don’t think that this is new – cf the John Deere magazine, supermarket freebie magazines, in-store product demonstrations etc which are all analogue versions of the digital world that you so rightly say is transforming communications. Certainly agree with you there Neil. Pingback: The Best Link Building For Local SEO -- None!